We visited the Gulliver’s Theme Park in Milton Keynes with our 2 year old daughter. We had visited before with a friends children, but that had been some time ago. 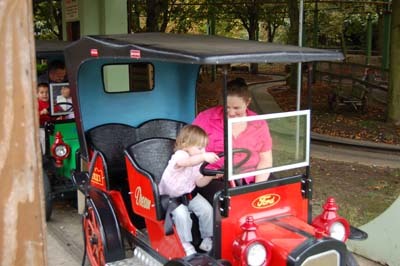 Unlike some of the well known theme parks, this one is specifically designed for young children. The target age group would be from Toddlers to about 10 years old, although is still some rides for children outside those ages, and even adults. There is a single charge for entry which then includes all the rides and attractions. It is all attractions that are included, as they have some rides that other parks would charge extra for (e.g. the JCB training school, and arcade type attractions). The admission price is the same for children as for adults, which reflects that this is a place for children. There is no minimum age where charges apply, but instead all children over 90cm must buy a ticket. Our daughter is just over 2 years old and was just under the 90cm, so she was free this time, but almost certainly won’t on our next visit. Using a minimum height for charging is a good idea in some respects as many of the rides are for children over 90cm (or for some rides allow the child to ride without an adult), but as our daughter is quite tall for her age she won’t be able to go on any extra rides because she isn’t old enough to ride unattended. When we went into the site it reminds you of a smaller scale Disneyland (Paris, rather than the California one). It has a similar layout with a main street from the entrance, and then several themed zones. 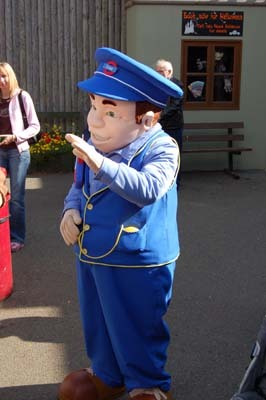 The Disney characters are replaced by Gully Mouse (or on this occasion Cbeebies’ Underground Ernie), but they don’t have any parades or any of the big attractions. Although rather than use the Under 5 playroom we took our daughter in the larger ball-pool / soft play area. She had to be closely supervised but seamed to enjoy the challenge. The under 5’s area is more geared towards very small children. Many of the rides needed adult supervision which could either mean sitting on the ride alongside the child, or standing next to the child on a roundabout. The rides are quite slow, so it’s easy enough to stand on them. As well as the rides there are also a few theatres which put on shows designed for different ages. We did try to watch the toddler’s show, but our daughter didn’t like the room being so dark so we had to leave. This entry was posted on Wednesday, September 26th, 2007 and is filed under Babies, Children, Tourism. You can follow any responses to this entry through the RSS 2.0 feed. Both comments and pings are currently closed.